If you’re as excited about the beginning of spring as everyone else, you’re probably already thinking of ways you can improve curb appeal for spring. You’ll be spending more time outdoors and you want to enjoy your home from the outside as much as you do on the inside. You also know that spring is the best time of the year to go outside and work on outdoor projects, so there is no better time than now to begin! Pressure washing is so easy, so simple, and it makes such a huge difference. Do the driveway, walkway, porch, garage door, and the entire house. You need to get rid of the grime and dirt that’s built up outside over the course of the last year, and spring is the perfect time to do it. This is one of the best ways to improve your curb appeal for spring, too, because it’s so simple and affordable. If you are not comfortable operating a pressure washer, hire a pressure washing service. Now that spring is here, it’s time to get your tools out and do some trimming. All the hedges need a good trim, and you should now remove any plants that didn’t make it through winter so you can replant some new ones that will brighten up your lawn. You also want to add new mulch to your flower beds once you’ve chosen your new plants and trimmed the hedges. This simple task has striking results. If your home needs a new coat of paint, spring is the time to do it. If not, you can skip painting the entire house and consider a fresh coat of paint where needed. Perhaps the shutters are looking a little dull and faded, or maybe you want to freshen up your front door with a new color. If you have something to paint outside your home, now is the best time to start painting with this beautiful weather. It’s also a perfect way to improve curb appeal for spring. In many places across the country, it’s already time to start mowing the lawn again. If you do it yourself, it’s time to get outside and cut. If you hire this job out to someone else, call them to schedule your first cut of the season. Even if the grass isn’t high, it might not be even and pretty. A fresh mow can do wonders for curb appeal, and even the neighbors will be envious of your fresh cut. You can go online and order a brand new carriage house door kit for less than $50 with free two-day shipping from everyone’s favorite online retailer, and it makes the biggest difference. 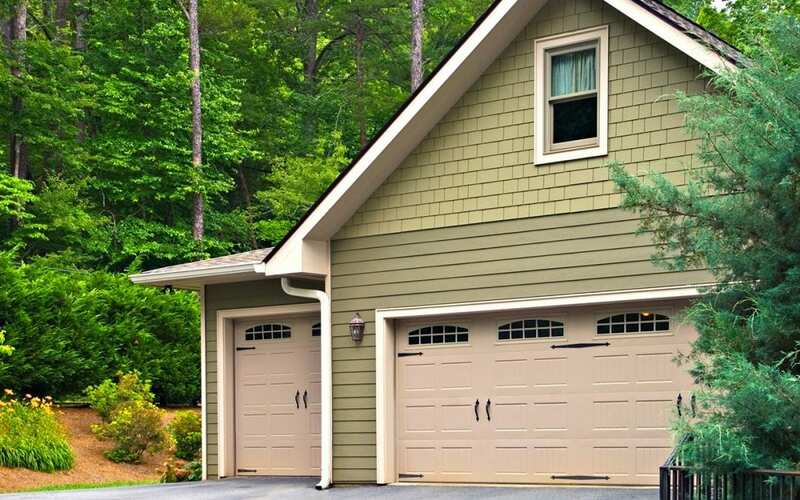 A carriage house door kit is simple, but it’s one of the most striking changes you can make to your garage door. You can get them sticky, magnetic, or you can screw them into the door, but these simple handles and decorative pieces take only 10 minutes to install and make the biggest difference in the world. You can change the entire face of your home in a matter of minutes with these. It’s the easiest and most amazing pop of boldness and beauty to add curb appeal for spring. Your home should look just as good on the outside as it does on the inside. You want to be outdoors working in the yard when the weather is this nice, so spring is a great time to make the home feel a little brighter and happier. By following our tips, you can easily improve curb appeal for spring, whether you are preparing to put your home on the market or just want to freshen up the exterior aesthetic. Appalachian Inspection Services serves the Western North Carolina region with home inspection services including radon testing and inspections for new construction. Contact us to schedule an inspection.